In this Falstad Build Guide, we provide an overview of his strengths, abilities, talents and matchups. Falstad is a global assassin that provides high levels of damage. With strong mobility and soft crowd control, he has the tools necessary to keep himself safe while taking out priority targets. He can completely turn team fights when played correctly, or be a non-factor when played poorly. Like most assassins, Falstad is reliant on others around him to distract the enemy so that he can freely attack and if he's allowed to do this, his damage can be invaluable to any team. I should also add that his ability to fly to any location on a Battleground (within a certain range) makes him invaluable at capturing specific objects or split pushing. He can comfortably soak a lane before arriving into a team fight and with the right positioning on his Heroic (Mighty Gust) can quickly come to the aid of his team. Be aware however, that if Falstad is focus-fired, he can die incredibly quickly and like most assassins, is very vulnerable to crowd control. Flight (Z): Falstad has access to Flight, which will very quickly transport him anywhere on the map within a large radius (with a 75 second cooldown.) This has a variety of uses, including quickly getting back to lane after healing, chasing down a fleeing enemy, counter-ganking, and split-pushing. It's particularly useful on large Battlegrounds, where he can arrive into a fight late while still soaking XP. Hammerang (Q) - has a variety of uses. It can be extremely efficient wave-clear, as long as you don’t let yourself run too low on mana while using it for this purpose. Your hammer also deals a fair amount of damage, making it useful for both poke damage in lane, and team fights when you can hit multiple targets. The slow on it makes it a great tool to chase down your targets, as well as secure your own escape. Try to use Hammerange before an enemy escapes to give you enough time to chase them but also use Lightning Rod as well. Lightning Rod (W) - This is extremely effective in an all-in, and a large part of what makes Falstad able to win a lot of 1v1’s. The single target damage from Lightning Rod is quite high, but it does require you to stay in close proximity to your target. As such, it can leave you vulnerable if you’re not careful, so make sure to be aware of your surroundings before committing to staying in range for the full duration. Barrell Roll (E) - is useful for much more than just being able to yell “Do a barrel roll!”. Against a single target, this can help keep you in range to secure the kill as they’re attempting to get away. However, make sure that your target is alone before dashing in, otherwise you’ll find yourself dead quite quickly. The more common use of Barrel Roll is to make sure you can escape, as it makes you untargetable, and can get over most terrain as well. Hinterland Blast (Heroic) - It used to be incredible but unfortunately its damage is fairly poor considering you need perfect aim and in most instances will only finish off players that are already low health. If you use it too early in a team fight it's likely the enemy team will be healed up, too late and you risk missing as the enemy team splits. If you do take it, try to use it when the enemy team are low health (around 25%) to pressure them and be sure to hit as many people as possible to utilise its reduce cooldown. Mighty Gust (Heroic) - A well-placed Mighty Gust can completely isolate an enemy, and leave them out of position and is often the best choice for Falstad simply because of the amount of control it provides. Whether it's defending a Boss capture, flying over the enemy team and blasting them back into yours - Mighty Gust is invaluable. Although Falstad relies heavily on his abilities to deal high damage, his basic attack is still incredibly important. When laning and killing a minion or Hero, Seasoned Marksman boosts his damage by 0.2 or 0.5 respectively. Capping out at 40 bonus attack damage, Seasoned Marksman then provides Falstad with an active ability to gain increased attack speed. Variable: Falstad is the king of split-push thanks to his ability to fly around any Battleground. Wingman allows Falstad to acquire 20 stacks to Bribe a mercenary camp, allowing him to instantly defeat them. As long as he's regularly soaking lanes, it's easy to reach the target and on Objective based Battlegrounds, you can then snipe an enemy camp to pressure them even more. Best of all, for every Mercenary you defeat you increase the damage of Lightning Rod by 5%. Hammer Gains is incredibly useful for Falstad because it allows him to not only clear camps quicker, but also provide himself with sustain when in lane. You'll regain health based on 20% of the damage dealt, allowing you to excel in 1 on 1 situations while giving you much better lane push. Variable: Falstad will often find himself 1 on 1 due to his global ability and his need to split push. Static Shield provides some much needed defence as it offers a shield every time he lands Lightning Rod, totally 4% of his maximum health per strike. If you can maintain your strikes against an opponent, your shield will stack and help keep you alive. Purely because of the burst BOOMerang offers, it's a solid pick. If you can explode your Hammerang in the middle of an enemy group, it's a high amount of damage output that compliments your basic attacks. Variable: This talent synergizes extremely well with Power Throw and Seasoned Marksman. With the Hammerang now out for a longer period of time, you can get off more empowered basic attacks using Secret Weapon. This is a huge power boost that’s difficult for enemies to account for in the middle of a fight, and will allow you to take down your target significantly more quickly. The go-to Heroic for Falstad, Mighty Gust is all utility. Whether it's saving your team from being attacked, or blasting an enemy into your team, Mighty Gust can buy you lots of time to recover or regroup. On objective heavy maps that require interaction it can also be incredibly strong for allowing your team to use the object. Variable: When talking about a strong variable, Hinterland Blast is high on the list. With its extremely long range and reasonable damage, Hinterland Blast can be used to snipe a low-health enemy who’s on the run. However, the more effective use is usually during a team fight, rather than at the end. If the enemies are grouped up, a good Blast across their team can turn an even 5v5 into a slaughter rather quickly. When pursuing a purely mage-based Falstad build, take Flow Rider. While your trait is active your skills will have their cooldown reduced by 100%. I will add that maximizing Flow Rider requires exceptional positioning to allow Falstad to get the most out of it, as taking damage prevents the talent from working. That said, when it comes to being level 16 it will pay off. Variable: Giant Killer is a good alternative that builds into this build focusing on basic attacks. Although I'd still argue Flow Rider is stronger in general, the additional 1.5% damage (based on an opponents maximum health) that Giant Killer affords a nice boost versus any high health composition. Aerie Gusts is a brilliant talent as it allows you to capitalize on Flow Rider. Reducing your Trait to only a 3 second cooldown but also gaining a 100% reduction to your cooldowns during this period can lead to some eye watering damage if you're left alone. Variable: With the Hammering being Falstad’s only reliable crowd control, increasing its effectiveness can be crucial. Whether using Crippling Hammer to prevent the escape of a fleeing enemy, or securing your own safe passage out of an engagement, getting that extra slow can be invaluable to a squishy Assassin. On particularly large maps where mobility is key, take Epic Mount. It reduces the cooldown of Flight to 30 seconds and reduces the cast time before flying to 0.5 seconds and increases its speed by 50%. Only Dehaka can rival such mobility. Variable: Nexus Frenzy is a great alternative on smaller Battlegrounds as it builds on your basic attack potency and increases your range by 1.1 but also increases your attack speed by 20%. These Hero Threat Levels (1 being lowest threat and 10 being highest threat) are to help you determine which enemy Heroes can give you a headache. Any Heroes that aren't on this list are easy pickings for Falstad. If a Hero is listed here, take greater care. Illidan: His mobility combined with his shielding/evasion make him a real nuisance. Even with your knock back, he can still harrass you quite easily. Kerrigan: Her stun, pull and self shielding mean she can deal huge damage to you. Your heal might trigger but her shielding means she'll stick to you if you don't have your knock back. Murky: It might sound silly, but Murky is a nightmare. His movement, Bubble and health regen make him a real nuisance to fight against. Nova: She can nuke Falstad down nearly instantly and turn her attention to you. If she takes Tripple Tap, you're in trouble. The Butcher: His health regeneration from Butcher's Brand combined with Lamb to the Slaughter mean he can tie you down. Thrall: His self healing, ability to root you and his Chain Lightning make him a real threat. Combined with his Wind Fury, if he gets close you're going to melt. Zeratul: Similarly to Nova, his ability to burst from cloak means that at the very least you'll take a beating. This section of our guide contains a list of tips and tricks we think will help your Falstad play. We'll continue to add to the list as required and if you have any tips you'd like to share, let us know in the comments below and we'll place them here. 1. Your Flight (Z) has a long cooldown and a wind-up time. Be sure to use it that little bit early if you need to be somewhere quickly. 2. Flight allows Falstad to pretty much gaurentee a vision "watch tower" on the map if he flies to it the moment the match starts. Only Dehaka can beat him to it. 3. It's a good idea to use Flight into a bush or vent so that when you do arrive, you're hidden on landing. 4. 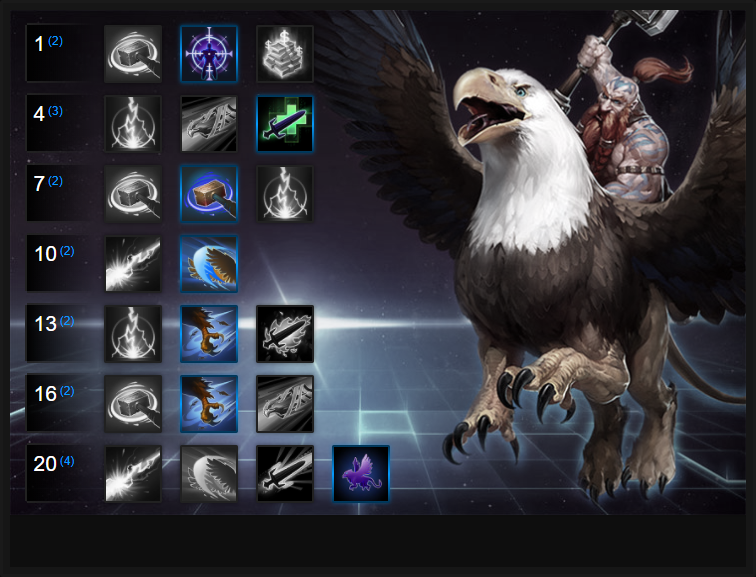 Drafting Falstad is strongest on large Battlegrounds where he can regularly make use of his mobility. Braxis Holdout, Towers of Doom and Warhead Junction are particularly strong. 5. If you pre-select your Flight, you can look on the mini-map to see the radius of how far you're able to fly. 6. Don’t underestimate the damage of Hammerang, even at early levels. Just a bit of poke damage can completely dissuade enemies from trying to aggress on you in lane. 7. Hammerang travels in a linear path, straight forwards and back again. Try to aim it so it hits both ways. 8. Ideally you want to Hammerang > Lightning Rod > Basic Attack on a player for maximum damage. 9. Hammerang is pretty mana intensive. Try to only cast it when it can hit a player (or minion wave). 10. Hammer is undoubtedly Falstad's best wave clear. End-game can see him clear it instantly. Don't be afraid to push. 11. Barrel Roll can be used defensively to escape, or offensively to catch up to a fleeing enemy. Key to playing Falstad is knowing when to be defensive or aggressive. 12. Be very careful when using Barrel Roll offensively. If you don’t know where the rest of the enemy team is, you may just be throwing yourself at them while simultaneously blowing your only method of escape. 13. Lightning Rod has a fairly small radius. To ensure each of its consecutive attacks hit your opponent, Barrel Roll into them once it's activated. 14. If you take it, don’t only use Hinterland Blast to snipe a kill. While it’s extremely satisfying to do so, landing it on multiple enemies at the start of a team fight will often be a much more effective use of the ability as it'll soften their health considerable. 15. While you’d love to take out the primary damage dealer on the enemy team, don’t rush past multiple Warriors to do so. If you’re in the middle of the opposing team without backup, you’re just going to die instantly. Don’t listen to people yelling at you about “focus the healer.” Your job is to hit the highest priority target that you can safely get to. If that’s their front line, then you’ll absolutely be focusing the tank. 16. Given that some Assassins need time to scale up, it can be easy for your opponents to assume you don’t have a lot of early damage. If you can land some unanswered poke in lane, go ahead and Barrel Roll in to show them that they were mistaken. 17. Remember to split-push as Falstad. On objective maps you can afford to soak in lane before flying to the fight at the last minute; preferably after securing a camp with Bribe.